Event theatre is a curious phenomenon that is hard to predict and can emerge from a number of paths. Most often it is due to an attachment of a star name that turns a popular play into a must see; the Cumberbatch Hamlet being an extreme examples of this. Sometimes, such as with Jerusalem or Constellations, word-of-mouth and press reviews suddenly turn an unknown new play into the thing people are queuing round the block for. Most gratifyingly is when it assigned to a theatre company on the basis of their hard graft built over many years; Complicite gained this status, and surely Headlong have now joined their ranks. Among those versed in theatre, Headlong are a by-word for theatre that promises endless invention built on energetic staging working in harmony with high class visuals. People, Places and Things is without doubt pure event theatre – it matches a theatre company that can sell-out a show before it opens with a lead performance that is rightly being described as career-making. 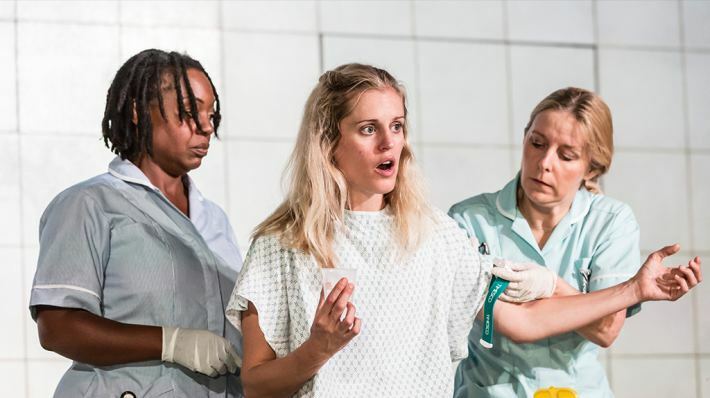 You leave the theatre feeling that you have seen a very special production, with an exhilaratingly powerhouse piece of acting from Denise Gough at its heart. It is the highlight of Rufus Norris’ early tenure at the National, and a production that reminds you how truly invigorating theatre can be. By pure chance I had seen it within days of seeing the devastatingly powerful Song From Far Away at the Young Vic. They work as superb companion pieces, and anyone who sees both cannot help but reflect on what they tell us about the mental outlook and wellbeing of the younger generations in affluent, western societies. Both cover individuals at the point of crisis, but touch on different ends of the spectrum. In Stephens’ play, Willem is unable to articulate his need for help and his crisis reaches a more acute phase as he exists outside of supportive systems. In Duncan Macmillan’s play, we have Emma (or possibly we do, even her name remains ambiguous), another white, privileged and mainly unsympathetic character. However, unlike Willem, she is vocal and able to recognise that there is a point where she must ask for help. Yet even at that this stage she uses her facility with language to keep people at a distance; she uses words as a defence mechanism to keep people away from her true self. Her extrovert nature is the polar opposite to Willem’s introvert, but ultimately her personality finds her unable to find ways of expressing herself in order to avert a significant crisis. 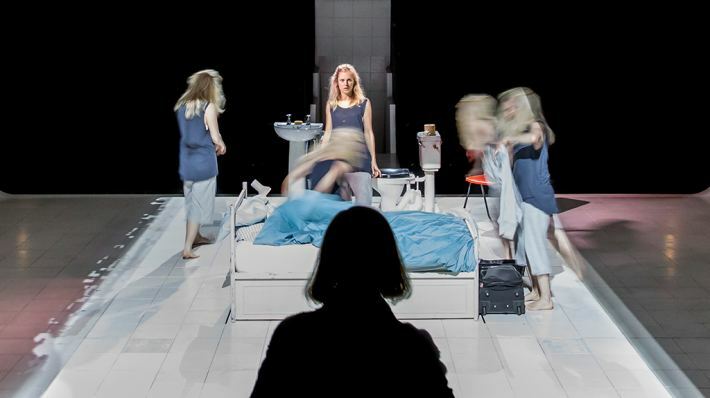 Denise Gough’s performance as Emma has drawn deserved plaudits. Her role in Tim Crouch’s Adler & Gibb hinted at her vast potential, and was one of the performances of the year. It was fluid, totally unselfconscious and demonstrated an assured facility for portraying characters on the edge of mania. She brings this and much more to Emma. On stage for basically all of the 2hr 20min running time, Emma is a huge and extremely challenging. It requires Gough to find a way of bringing the audience on the side of a character that is fundamentally unsympathetic, whilst challenging us to recognise the extreme danger that Emma’s forceful personality brings to the vulnerable people surrounding her. It is a delicate balancing act that Gough pulls off with masterful skill. Emma is self-obsessed, vain, feels she is morally and intellectually to those around her, yet these traits also lead her to being smart, combative and assertive. She assumes an outsider status and at times it is easy to buy into her belief of her position as the natural rebel, willing to speak truth to power. We are programmed to side with the individual raging against the system. Yet the skill and subtlety of the performance is that this duality – this tension between rooting for her, and recognising the damage that she poses to those around her – always remains visible and means the audience is kept unbalanced. Macmillan’s script also allows us to see vulnerability in Emma that she can’t necessarily see in herself. We can see she is still sinking when she believes she is on the way up. The final scenes where Emma seeks reconciliation with her parents are shocking not because it shows the gap between her imagination of the reconciliation and the reality of it, but because it reveals yet more truths that Emma had kept hidden (the revelation of the piano is a small detail but says a huge amount). Whereas Simon Stephens’ wrote a tight 75-min monologue to capture the truth of Willem, MacMillan’s piece stretches well over two hours. However in Headlong and Jeremy Herrin’s hands, it feels the lighter and shorter of the two. To say it is enjoyable feels inappropriate given the subject matter, yet it is. 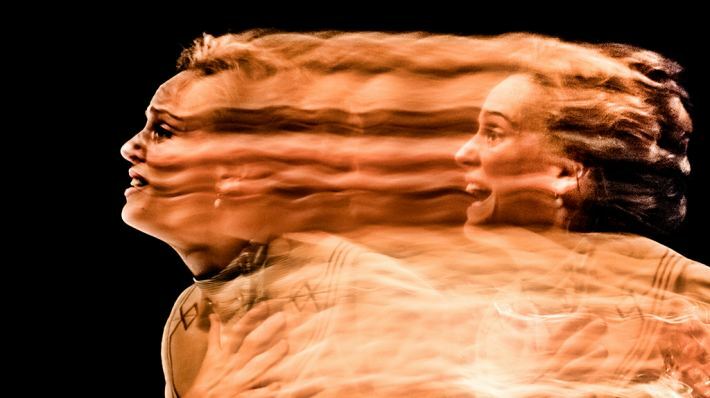 It has Headlong’s traditionally hyper-kinetic style, it is always fluid and scene changes are visually inventive and blur into one another so the audience are rarely given time to breath. Ultimately Song From Far Away edges People, Places and Things in its writing, and ultimately feels like the more important of the two works. However in terms of pure theatricality, in star-making potential and visual splendour, Headlong and Denise Gough come out on top. It is a production that should not be missed.